The Balinese low-rise architecture allows for privacy and spaciousness in all guest rooms and suites. You have space to expand, space to unwind, and views out over the ocean or surrounding gardens. Now, in a wide choice of accommodation, experience every luxury and modern comfort, and furnishings that reflect the Balinese tradition of gracious hospitality. Occupying key locations throughout the Resort are our unique split-level Loft Rooms. There are Junior Suites, Japanese Suites, Executive Suites and Presidential Suites. All rooms and suites have a private balcony or terrace, and air-conditioning. The resort is centrally located minutes from Bali's premier tourist areas. Yet our extensive location on Jimbaran Bay offers complete seclusion on the best white sand beach in Bali, where evening brings spectacular sunsets. Our Marine Sports Center offer a wonderful choice of water sports, and there are three swimming pools, and three outdoor jacuzzies in the gardens, as well as our appointed health club, Uluwatu Spa. The tempt you further, there are two squash courts and the Resort tennis courts. The magnificent 18-hole Bali Golf and Country Club is only a few minutes away. The Bali Inter-Continental Resort can create the most stimulating and exotic indoor and outdoor theme parties along with convivial social programs. Your tailor-made incentive package can be enhanced to exactly match your group's interest, be it leisurely cruise on a luxury catamaran and more. 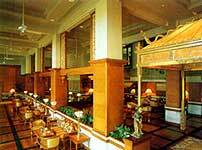 The Bali Inter-Continental has 425 rooms and suites with 10 non smoking rooms, 5 rooms with disabled facilities.